After Windows 8 debuted on Thursday, Microsoft's Steven Sinofsky offered his view of the computing landscape, and said PCs represent a great value when compared to "recreational tablets," alluding to Apple's new iPad mini. Sinofsky told AllThingsD that Microsoft has been able to work with its hardware partners to drive down prices to a point where students can get a computer good enough to last them through college. Although not mentioned by name, the Windows chief was referring to Apple's iPad mini, which went up for preorder on Friday. The mid-size tablet's pricing was cited as a possible hurdle for Apple, however preorders for all white and silver models sold out after being available for less than one hour. 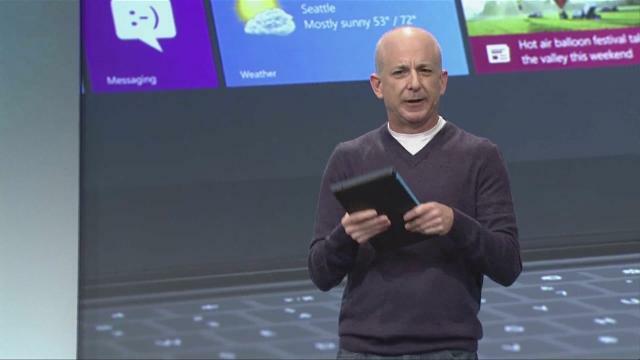 As for how Microsoft manages to offer laptops at below-tablet prices, Sinofsky said, Its not just discounting. Its engineering work that drives the cost down." The new Windows OS is seen as a significant release for Microsoft, as it takes the operating system into uncharted waters, attempting to bridge the gap between tablets and PCs. Sinofsky admitted that even Windows 8 can't be everything to all people, as evidenced by the Surface RT which runs a stripped down version of the operating system that isn't backwards compatible with older Windows software. Microsoft will launch the more full-featured Surface Pro, which runs a complete version of Windows 8, in a few months, though pricing is thought to start at $799. Sinofsky took time to defend the tablet after the device garnered some negative comments from Apple CEO Tim Cook, who said it was "compromised" and "confusing." The Microsoft executive countered, saying that while the iPad may be well-suited for a short getaway, Microsoft's Surface can "suffice" on longer business trips. He failed to explain how the Surface RT's price tag of $499, which jumps to $599 with an optional touch cover keyboard, is justified in light of his earlier statements about reasonable Windows 8 machines.